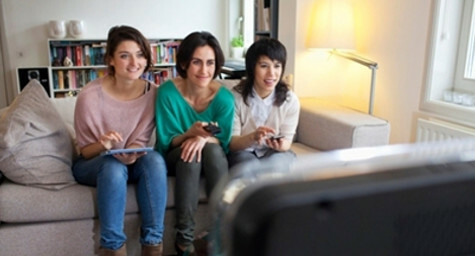 While the television industry is rapidly realizing that viewers are increasingly likely to be multi-tasking on multiple mobile and digital devices while watching TV, a recent study by Google with Sterling Brands and Ipsos revealed just how widespread this phenomenon has become. The study showed that 77 percent of the time that consumers are watching TV, they’re using another digital device, and that device is a smartphone half of the time. Adweek.com reported on the rise of this TV-smartphone media mix. While other digital devices were also used in combination, the TV-smartphone pairing was the most popular by far. Email usage in a multiscreen setting was cited by 60 percent of respondents, but email isn’t ideal for extensive digital marketing. Use of the Internet and social media followed for approximately 40 percent of respondents. Clearly, all of these media are valuable for digital marketing professionals looking to reach today’s consumers, but there was no comparison to the popularity of the TV-smartphone combination. “If I were to oversimplify, I would say that a direct-response advertiser cannot ignore the sequential use of devices because it’s a direct effect on how we shop and how we purchase,” said Jason Spero, Google head of global mobile sales and strategy. He added that it’s especially essential to pay attention to how connected devices are complementing TV. This demonstrates the growing trend of consumers using digital devices in both sequential and complementary ways. While the TV-smartphone combination was the most prevalent complementary multiscreen pairing, the sequential use of digital devices also deserves attention. In fact, 90 percent of respondents reported beginning an activity on one device and then finishing it on another. Using the Internet was the most common multiscreen sequential activity for 81 percent of respondents, followed by social networking for 72 percent, online shopping for 67 percent, and general Web searching for 63 percent of people. One of the most important takeaways from the study is the idea that TV content in the background is likely to be a catalyst for subsequent search action, whether on a smartphone, computer, tablet, or social media network. Understanding the promotional potential of multiscreen usage is essential for brand marketers seeking to maximize the value of their digital marketing and the extent of their reach. MDG Advertising, a full-service Florida marketing firm with offices in Boca Raton and New York, NY, specializes in developing targeted Internet marketing solutions, exceptional creative executions and solid branding and media buying strategies that give clients a competitive advantage. Our core capabilities include branding, logo design, creative, digital marketing, print advertising, mobile marketing, media planning and buying, TV and radio, website design and development, content marketing, social media marketing, and search engine optimization (SEO).